I just renewed my North American Rail Pass and jumped on a train bound for the tiny state of Rhode Island and it occurred to me that even though I’ve been traveling almost entirely by train I’ve yet to talk about those crazy kids at Amtrak. Let me just start off by saying, “I love traveling by rail.” There. Done. Over with. 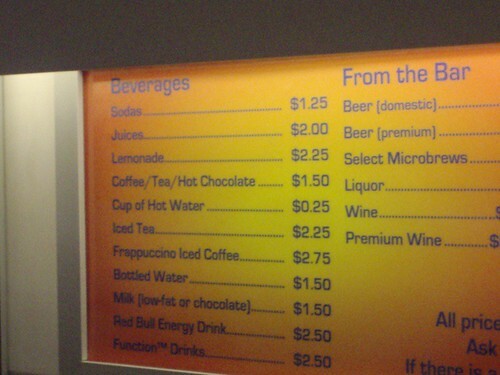 Take a look at this handy little snapshot of their drink prices. 2. There’s an 80% discount on water if you’re willing to let it cool down. (Hot Water = $0.25; Bottled Water = $1.50! Still!) So the energy loss in heating up water costs an additional negative $1.25?! I have a couple more things to say about Amtrak food service. First of all it should be a federal offense to serve a Girl Scout troop Frapachinos and Red Bulls. I HATE horror movies and it’s like watching a low budget Grudge re-remake as those little terrors crawl up and down the walls. Also, I spent quite a bit of money on a cheeseburger. You know how sometimes in burgers you get that little crunchy bit that kind of freaks you out. It’s way too hard to be meat but you just swallow it anyway, more out of fear than anything else because you have NO desire to find out what it really is. But most of the time you can enjoy a burger without ever once running into one of these mystery bits. 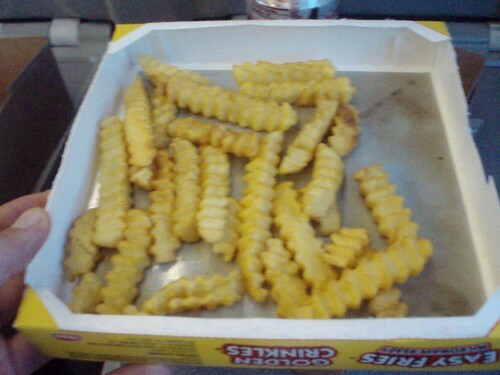 Further more, this is what $2.50 worth of fries looks like in Amtrak’s world. Even after all that I still prefer the train. But I think I can fix that. The big problem with air travel now days is security. It can take hours to get through TSA at some airports (Hartford, I’m talking to you.) and it can destroy an otherwise great travel experience. Because I only ever fly one way or on short notice I’m consistently flagged as a terrorist and forced to empty the contents of my carefully packed backpack. Every trip through an airport is a grueling experience. Don’t get me wrong. I LOVE the concept of air travel. Who doesn’t love getting where they’re going as quickly as possible? “So, Brett, how do we solve this ugly situation,” you ask? First, let’s examine how we got here. Some guy tries to blow up a plane with his shoes…now we all have to take our shoes off. Some guys try to blow up a plane with liquids…now we have to throw away all of our liquids. How do you get rid of something you don’t like? Break it. All we need to do as a country is to find ourselves a scapegoat willing to attempt another bombing. Here’s the important bit though: he has to try to blow up the plane using his pants. If that doesn’t work we’ll just have to find some lady that’ll try to blow something up with her bra. Oh yeah…I like the train. Want to help pay for travel costs? Buy a hot dog, I like to call them Hebedogs, you’ll know what I mean. Aside from metal underpants (always a good option), how do we solve this ugly situation? High speed rail! It’s a train AND it goes freakishly fast. What could be better than that? I am new to blogging. I just stumbled upon this great blog. Thanks for your blog. Definitely didn't go according to my plan.